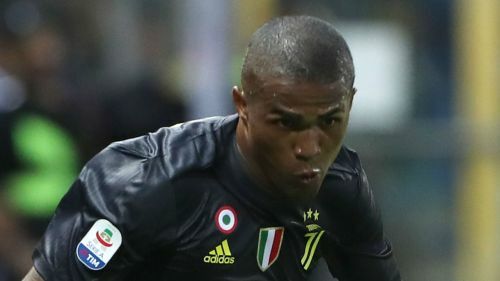 Douglas Costa has apologised for his "ugly" behaviour after he was sent off during Juventus' 2-1 victory over Sassuolo. Cristiano Ronaldo's double - his first goals in Serie A - proved the difference at Allianz Stadium, but it was Costa's awful conduct in the closing stages that will be remembered. The winger elbowed and headbutted Federico Di Francesco in the build-up to Sassuolo's late consolation, before spitting in the winger's face, and could now face a lengthy ban. And taking to his official Instagram account, Costa took full responsibility for his actions. "I want to apologise to all the Juventus fans for this over the top reaction I had during today's game," he wrote. "I also apologise to my team-mates, who are always by my side, in good and bad times. It was ugly, I am aware of that and I apologise to everyone for that. Ronaldo's first Serie A goal came in fortunate fashion, but lifted a huge burden off the former Real Madrid man's shoulders. His second was a more typical Ronaldo finish - a driven effort across the goalkeeper - and the 33-year-old took to Twitter to share the joy of finally breaking his Juve duck. "I am very happy to have scored my first double with the jersey of Juve and especially to have contributed to this important victory of the team," Ronaldo tweeted.